In the wake of the Turkish and rebel-affiliated campaign to capture the northern Aleppo countryside from the Islamic State (IS), termed “Euphrates Shield”, Turkey has put significant effort into providing local government resources and humanitarian assistance. The most ambitious of these efforts was the creation of a new police force from scratch, with a goal of creating security and stability for the civilians of north Aleppo.1.“Police deployed in Syria’s Jarablus after liberation” : Yeni Safak The police have been given a difficult task in serving the people of north Aleppo. complicated by local rebel groups contributing to conflict and lawlessness. Following the FSP’s arrival in Jarabulus, the project was expanded to other rebel-controlled areas of the northern Aleppo countryside. Azaz was the next town police were deployed to, with 1,300 officers being sent there in late February of 2017. Beyond Azaz, this new group was responsible for policing in several nearby locations including, Mare, Suran, Akhtarin, and al-Rai. The final location that police were deployed was al-Bab, as this was the largest town captured during Operation Euphrates Shield with a population of 63,000 before the war.5.Syrian General Census information As such, al-Bab received the largest number of police, with 2,000 being deployed there.6.“Security ensured in areas liberated by Turkey-backed FSA” : Daily Sabah Like in Jarabulus, these police were all trained in Turkey. However, unlike in Jarabulus, most of the police for Azaz and al-Bab were recruited from local populations in north Aleppo, though there were still recruits from refugee camps and rebel fighters.7.“Free Syrian Army getting backup from Turkish-trained police”: al-Monitor These locations became the main operational hubs for the FSP in northern Aleppo. The stated intention was for the police to operate in larger urban areas, while rebel groups would continue to have control in smaller villages and rural locations.8.Stein, Aaron, Abouzahr, Hossam, Komar, Rao : “Post-Conflict Stabilization: Turkey and the end of Operation Euphrates Shield” : Atlantic Council However, in practice this was difficult to implement, with several rebel groups reluctant to give up their authority and control in urban areas. The work carried out by the FSP to achieve their goals of establishing stability and security in north Aleppo varies greatly, and general tasks include standard policing operations such as searching for missing people, as well as more unique tasks like rehousing lions. 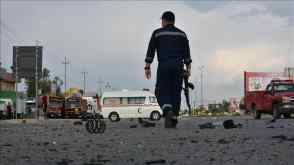 The average day-to-day work for a regular police officer includes manning checkpoints, carrying out searches, going on patrol, guarding buildings, and, of course, responding to reported crimes.9.“Hundreds of police trained by Turkey start work in northern Syria” : Reuters Crimes committed in Northern Aleppo vary, and range from opportunist thefts and muggings to more organized crimes such as systematic thefts as well as drug producing and smuggling. According to al-Rai police officer Major Firas Sheikh Muhammad, the police there deal with about 20-25 incidents a day.10.“Security ensured in areas liberated by Turkey-backed FSA” : Daily Sabah However, Al Rai is one of the smallest towns patrolled by the FSP, and places like Azaz, al-Bab, and Jarabulus will experience significantly more criminal activity. To assist in managing the variety of work they are required to do, the police are split into several different sections. This includes dedicated traffic police, a rapid response force, special forces, a drug force, and counter-terrorism police. Officers in many of those sections will receive extra training to ensure they are best suited for their role. Despite the difficulty of their tasks, it is undeniable that progress has been made by the FSP. Simply having a professional police force with training on how to deal with these situations is a significant improvement over the previous security situation of multiple rebel groups and IS’s particular brand of ‘justice’. An argument can be made that part of the problem with ongoing crime in northern Aleppo is that the police are still new, and have not settled into their role. The Azaz police chief expressed this same sentiment, while a local resident in Jarabulus stated, “It will take some time but the police can improve the security situation.”26.“Post-ISIS Governance in Jarablus: A Turkish-led strategy” : Haid Haid, Chatham House Their work has undeniably brought increased stability and security to north Aleppo, but moving forward there are significant challenges they must still overcome. This is the first part of a two-part article on the Free Syria Police in rebel-controlled northern Syria. The second part can be read here. Robert Postings is a writer for the International Review whose research focus is the Islamic State. As well as writing for the International Review he co-authored the 'Spiders of the Caliphate' research paper for the Counter Extremism Project and has published work with the Modern War Institute at West Point and The Defence Post.